Savoy cabbage, botanical name Brassica oleracea convar. capitata var. sabauda L, means the crinkling of leaves in French. There are three types of cabbage: loose head, michihili and barrel head. Savoy cabbage is a singularily unique barrel head type of cabbage. The most famous award-winning variety of Savoy cabbage is known as 'Savoy King'. Savoy cabbage is distinguished by its heavily textured, crinkled leaves with saw-like leaf margins. Its outer leaves are its toughest as they protect the plant from the elements during the growing season. Those leaves are heavily veined, dark green to light green in coloring. The inner leaves that lack sunlight, fare on the paler green, creamy yellow to white color spectrum. The leaves are crunchy, succulent and tender. Their flavoring mild, grassy and sweet with slight cruciferous undertones. 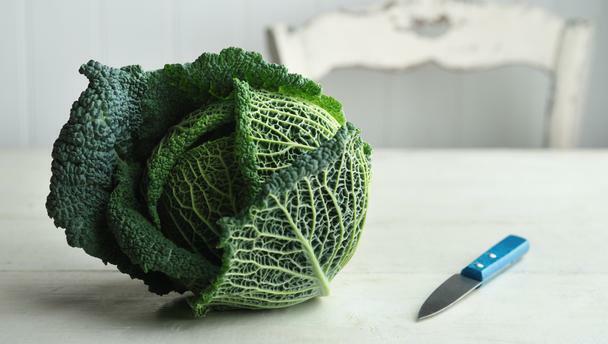 Savoy cabbage is considered the most versatile of all cabbages, readily replacing both western hard-heading types and Chinese loose-heading varieties. Its texture and flavor can supplement soups, stews and salads. Favorable ingredient pairings include herbs such as sage, thyme, caraway, dill, mint and fennel, horseradish, apples, onions, garlic, shallots and juniper berries. Savoy cabbage is a sponge for rich ingredients such as cream, cheese, sour cream, olive oil and bacon fat.